The accident in reactor no. 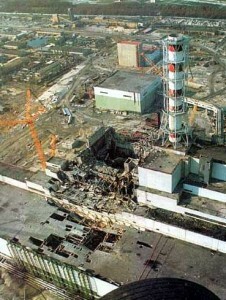 4 at the Chernobyl nuclear power station took place in the night of 25 to 26 April 1986, during a test. The operating crew planned to test whether the turbines could produce sufficient energy to keep the coolant pumps running in the event of a loss of power until the emergency diesel generator was activated. In order to prevent the test run of the reactor being interrupted, the safety systems were deliberately switched off. For the test, the reactor had to be powered down to 25 per cent of its capacity. This procedure did not go according to plan: for unknown reasons, the reactor power level fell to less than 1 per cent. The power therefore had to be slowly increased. But 30 seconds after the start of the test, there was a sudden and unexpected power surge. The reactor’s emergency shutdown (which should have halted the chain reaction) failed. Within fractions of a second, the power level and temperature rose many times over. The reactor went out of control. There was a violent explosion. The 1000-tonne sealing cap on the reactor building was blown off. At temperatures of over 2000°C, the fuel rods melted. The graphite covering of the reactor then ignited. In the ensuing inferno, the radioactive fission products released during the core meltdown were sucked up into the atmosphere. The test during which the accident happened was conducted under time pressure. Shortly after it started, on Friday 25 April 1986, the test run was interrupted for nine hours. Electricity still had to be supplied to the capital, Kiev. The test then took place at night. Today, several flaws in the technical design of the reactor type are thought to have been decisive. To put out the fire and thus stop the release of radioactive materials, firefighters pumped cooling water into the core of the reactor during the first ten hours after the accident. This unsuccessful attempt to put out the fire was then abandoned. 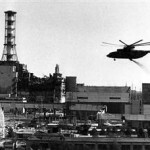 From 27 April to 5 May, more than 30 military helicopters flew over the burning reactor. 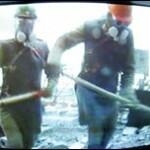 They dropped 2400 tonnes of lead and 1800 tonnes of sand to try to smother the fire and absorb the radiation. These efforts were however unsuccessful. In fact they made the situation worse: heat accumulated beneath the dumped materials. The temperature in the reactor rose again, and thus also the quantity of radiation emerging from it. In the final phase of firefighting, the core of the reactor was cooled with nitrogen. Not until 6 May were the fire and the radioactive emissions under control.